The Gladius | What song the Sirens sang . . .
← Hoplites: Armor and Fighting Strategies. 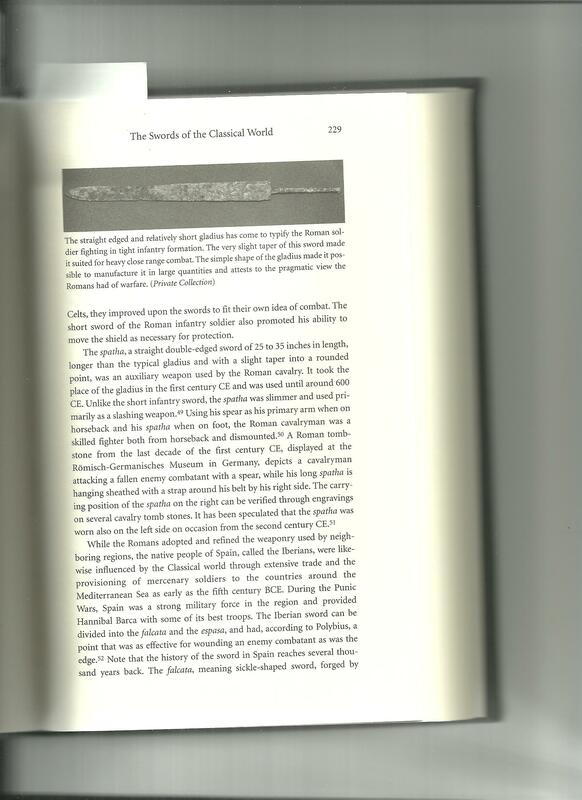 The gladius got its start in the Punic Wars, it was an amalgamation of two Iberian swords, the falcata and the espasa. Though Sprague writes, “the espasa was adopted by the Romans and resembled their double-edged straight short sword, also called the gladius hispanicus, or Spanish sword” (p.230, Sprague) Sprague shows the espasa is what influenced the Romans more than the falcata. These blades were the best the Romans had come across in their travels. Polybius said of these swords (both the falcata and espasa) that they had “a point that was as effective for wounding an enemy combatatant as was the edge.” (p.229, Sprague). By the end of the second Punic War, the Roman in effect used the Spanish sword to defeat the Carthaginians and push them out of Spain and put down the Iberians (the Spanish). The most common gladius used during the Second and Third Punic Wars was arround twenty inches. Its main purpose was as a thrusting weapon, yet like all blades slashing was not out of the question. In combat “when the legionary had thrown his pila he drew his second weapon, the gladius. This was a short, broad-bladed, acutely pointed weapon intended purely for stabbing.” (p.34, Wilkinson). This is expanded on in Roman Military Equipment: “the gladius Hispaniensis, as it has come to be known (the term gladius could refer to any sword), is often thought of as quite straightforward: the Romans encountered the weapon in Spain for the first time, were so impressed they adopted it” (p.54, Bishop). As we look back on the Romans we should understand that “the gladius became a trademark of the Roman troops not because of the design, but because of the discipline of the Roman legions.” (p.248, Sprague). Meaning even if the Romans had adopted the khopesh, their ability to adapt and use troops would have triumphed over any drawbacks of design. M.C. Bishop and J.C.N. Coulston, Roman Military Equipment: From the Punic Wars to the Fall of Rome (Oxford: Oxbow Books, 2009), 54. Martina Sprague, A History of Edged Weapon Warfare (Yardley: Westholme Publishing,LLC, 2009), 229 (both quote and image), 238, 248. Frederick Wilkinson, Arms and Armour (London: Chancellor Press, 1996), 34. What I find really interesting about your blog is the amount of information we have been able to find out about this weapon from centuries past. They said that the Romans granted citizenship to those they conquered, from reading your blog it seems that they also adopted and adapted the weapons from the surrounding areas as well. I was really impressed how you organized the material and described the gladius to us. I didn’t know that the gladius was a trademark of the Roman army. You would have to spend a lot of time making sure that the swords were in great shape and sharp enough to be effective when they went to battle. I thought this blog was very interesting and got me thinking of the kind of weapons the Romans had.